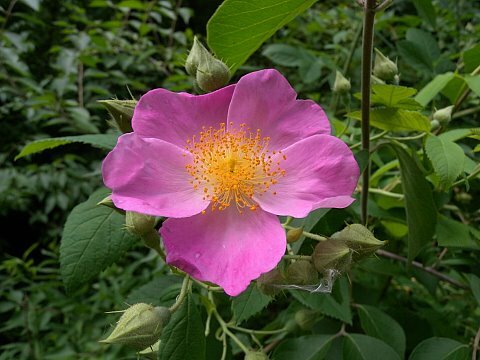 Rosa setigera.john Hilty.www.illinoiswildflowers.info (Accessed 8/2014). Rosa setigera is a prickly shrub, stems climbing to 6 m tall, prickles relatively sparse, broad-based, curved back, in pairs or solitary along internodes; stipules very narrow, with glandular hairs along margin. Leaves alternate, pinnately compound, leaf stalk glandular-hairy; leaflets 3 or 5, narrowly egg-shaped, to 10 cm long, glossy, hairless, veins impressed above, paler, sometimes hairy below, tips pointed, margins sharply toothed, terminal leaflet stalked, lateral leaflets almost stalkless. Flowers pink, showy, numerous, to 8 cm wide, stalks and flower base (hypanthium) glandular-bristly, sepals to 1.6 cm long, curved back, deciduous, anthers numerous, styles united in a column; blooms June-July. Fruit elliptic brown-green to red to 1.2 cm wide about 2 cm long. Origin: Native west and south of NYC region.